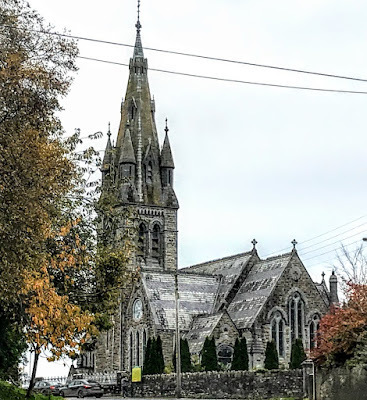 The Church of the Immaculate Conception in Ballingarry is one of a handful of churches in Co Limerick designed by AWN Pugin’s Irish successor, James Joseph McCarthy (1817-1882). McCarthy’s other churches in Co Limerick include Saint Saviour’s Dominican Church in Baker’s Place, Limerick; Saint Senanus Church, Foynes; Saint Mary’s Church, Rathkeale; and the Church of Saint Peter and Saint Paul, Kilmallock. He also remodelled and enlarged the Church of the Immaculate Conception in Newcastle West and designed Cahermoyle House for the family of William Smith O’Brien. McCarthy completed Pugin’s work at Maynooth and Saint Mary’s Cathedral in Killarney, and his other cathedrals and churches include Saint Aidan’s Cathedral, Enniscorthy, Saint Macartan’s Cathedral, Monaghan, the Cathedral of the Assumption, Thurles, Saint Colman’s Cathedral, Cobh, the ‘Twin Churches’ in Wexford, Saint Catherine’s Church, Dublin, and the Passionist Church in Mount Argus. The spire of McCarthy’s church in Ballingarry can be seen for miles around. This is a fine late 19th century church, prominently sited, and it continues to have a strong presence in the Ballingarry streetscape, providing a focus in the area. The church was built on the site of an earlier T-plan Catholic chapel in Ballingarry, and was dedicated in 1879. The coherent decorative scheme is marked by its elaborate tower that unifies the Gothic style of the building. The rusticated masonry, which was popular in church architecture of the time, adds a textural interest, balanced by the tooled limestone dressings. The interior reflects the Gothic style of the exterior and is also highly decorative, with ornate tiling on the floor and sophisticated carpentry in the roof. 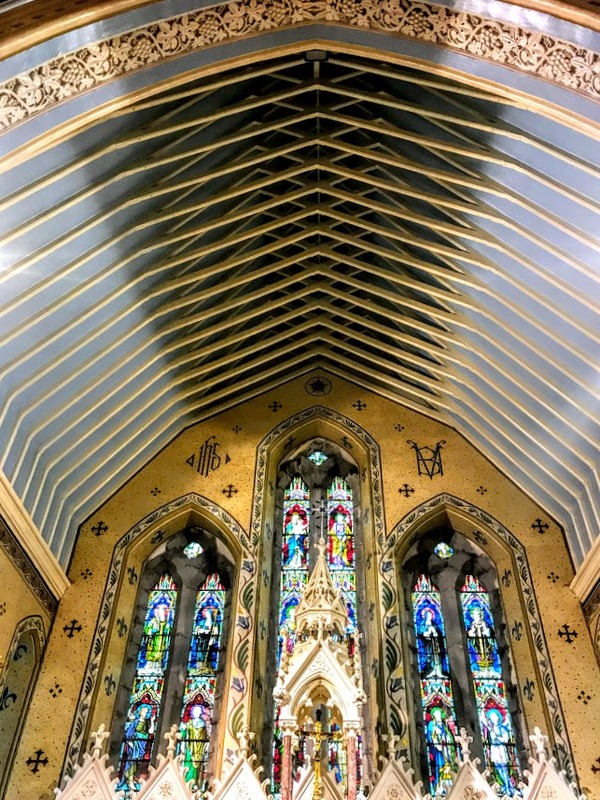 The mosaics on the chancel walls and the ornate corbels further enliven the interior. The arcade of finely carved marble columns adds another element of richness and colour to the interior of the church. The piers and gates at the front of the church are highly ornate and continue the Gothic Revival idiom of the site. According to Patrick J O’Connor, in his Exploring Limerick’s Past, the first Roman Catholic Church at Ballingarry stood on the same site from the early 18th century. When Father James Enraght was appointed parish priest of Ballingarry in 1851, he was in America raising money to build a new church in his then parish of Askeaton. He then started building a new church in Ballingarry, and the foundation stone was laid in 1872. 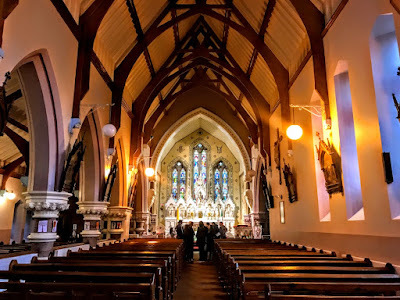 But Father Enraght was moved onto Parteen in 1874 before the church was finished, and he was succeeded by Father Timothy Shanahan, who supervised the completion of the new church, which was consecrated on 7 September 1879. The High Altar is the work of Edmund Sharp (1853-1930), and in 1890s Pugin’s son-in-law George Coppinger Ashlin (1837-1921) drafted proposals for a ‘throne’ to the High Altar. The builder was Michael Walsh of Foynes, who also worked with McCarthy on this churches in Foynes, Rathkeale and Kilmallock. The church has an eight-bay nave, two transepts, a hexagonal turret, a gable-fronted porch, a four-stage square-plan battered tower, and a gable-fronted chancel with flanking side chapels. There is a four-bay side aisle, a single-storey over basement sacristy and a canted side chapel. The pitched slate roof has a fish-scale pattern, cast-iron ridge crestings, limestone brackets and limestone copings with cross finials. The sacristy has a limestone chimney-stack. The church has rusticated sandstone walls with tooled limestone quoins, buttresses, limestone plaques, trefoil-headed lancet stained-glass windows with limestone hood-mouldings, and Corinthian style columns with banded marble shafts, timber panelled doors with ornate cast-iron strap hinges, and a timber scissors truss ceiling. The chapels and transepts have oculi, the entrance has a timber gallery, and the floors have geometric tiles. The sandstone and limestone tower has limestone turrets and a cast-iron spire. Father Ronald Costelloe restored the church in 1991. 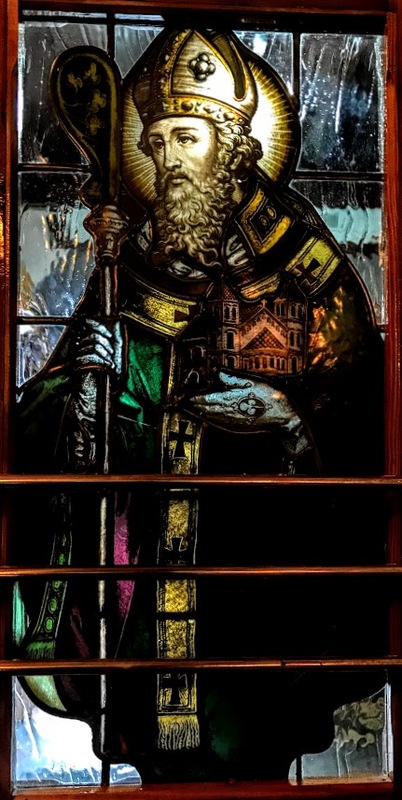 On the inside doors of the church, there are stained glass panels of Saint Patrick and Saint Ita to commemorate the 100th birthday of Archdeacon Patrick Lyons in 1993. The priests of the parish buried here include Father William Downes (PP 1894-1901), who is buried inside the church, and Canon Thomas Wall (PP 1936-1956), Archdeacon Patrick Lyons (PP 1956-1982) and Father Gerard MacNamee (PP 1982-1988), who are buried in the churchyard.